For the first time, astronomers have detected a planet outside our Solar System pass in front of its parent star in X-rays. The X-ray data suggest the planet HD 189733b has a larger atmosphere than previously thought. The parent star may be evaporating the atmosphere of HD 189733b more quickly than expected. Astronomers used Chandra to observe six transits and archival data from XMM-Newton to detect one. 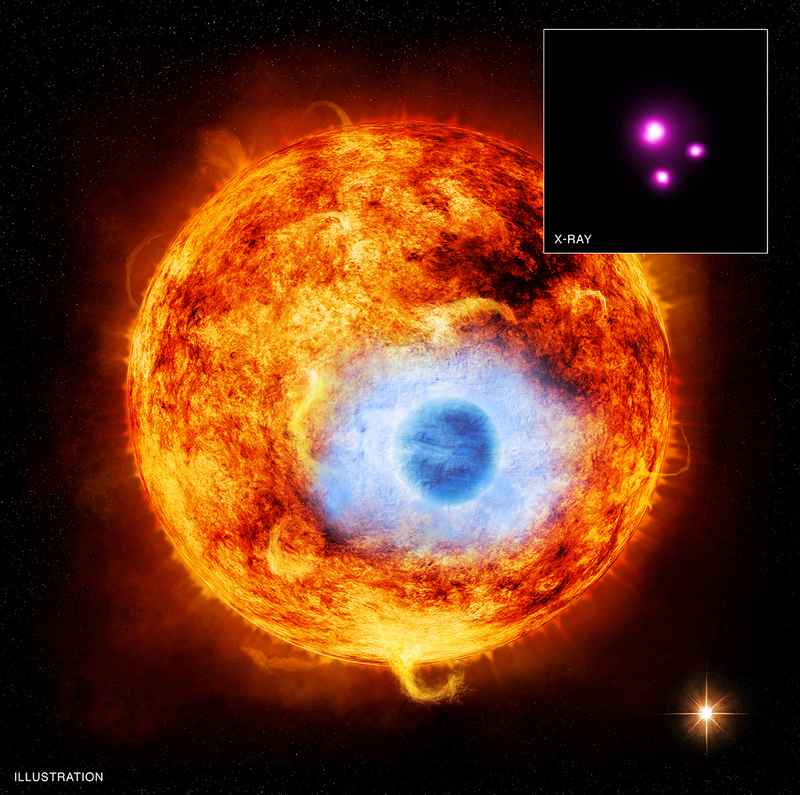 This graphic depicts HD 189733b, the first exoplanet caught passing in front of its parent star in X-rays. As described in our press release, NASA's Chandra X-ray Observatory and the European Space Agency's XMM Newton Observatory have been used to observe a dip in X-ray intensity as HD 189733b transits its parent star. The main figure is an artist’s impression showing the HD 189733 system, containing a Sun-like star orbited by HD 189733b, an exoplanet about the size of Jupiter . This "hot Jupiter" is over 30 times closer to its star than Earth is to the Sun and goes around the star once every 2.2 days, as determined from previous observations. Also in the illustration is a faint red companion star, which was detected for the first time in X-rays with these observations (roll your mouse over the image above). This star orbits the main star about once every 3,200 years. The inset contains the Chandra image of HD 189733. The source in the middle is the main star and the source in the lower right is the faint companion star. The source at the bottom of the image is a background object not contained in the HD 189733 system. The exoplanet itself cannot be seen in the Chandra image, as the transits involve measuring small decreases in X-ray emission from the main star. The authors estimate that the percentage decrease in X-ray light during the transits is about three times greater than the corresponding decrease in optical light. This tells them that the region blocking X-rays from the star is substantially larger than the region blocking optical light from the star, helping to determine the size of the planet's atmosphere. The extended atmosphere implied by these results is shown by the light blue color around the planet. Recent observations of HD 189733b with the Hubble Space Telescope have confirmed that the lower atmosphere of the planet has a deep blue color, due to the preferential scattering of blue light by silicate particles in its atmosphere. For about a decade astronomers have known that ultraviolet and X-ray radiation from the main star in HD 189733 are evaporating the atmosphere of its closely orbiting planet over time. The authors of the new study estimate that HD 189733b is losing between 100 million and 600 million kilograms per second. This rate is about 25% to 65% higher than it would be if the planet's atmosphere were not extended. At a distance of just 63 light years, HD 189733b is the closest hot Jupiter to Earth, which makes it a prime target for astronomers who want to learn more about this type of exoplanet and the atmosphere around it. Chandra was used to make observations of six transits by HD 189733b and the team also used archival data from XMM-Newton for one transit. These results are available online and will appear in a future issue of The Astrophysical Journal. I would like to read more information. I am very excited to know about the other planets. This is amazing.I am very excited to know about the other planets. It is so exciting about the number of planets found around other suns. Do you think that there might be some kind of life on this planet, or do you think that being so close to its sun there would not be any possibility of life on this planet? Great technology& greatest curiosity and finally the best coordination of bugets and cooperation of different parts of Nasa. I say we should rename this planet. This is an exciting moment for me to realize that there is an infinity.